What can we do to Support the Recyclers? First of all educate ourselves and others about what can be recycled, and also aim to understand the processes involved. Then concentrate on buying where possible food and consumer goods that come in the materials that can be recycled. Supporting the recycling Industry in all its forms will help to gain momentum to recycle within our society, and will give the recyclers more power to develop techniques and processes to recycle more types of materials, and in bigger quantities.As a community group interested in the recycling process, contact one of the companies engaged in this work, and ask to arrange a visit to their premises. Contact information should be available through your local council, or from the nearest recycling centre.Seeing what happens firsthand is always inspiring, and could well mobilise you and your community into action. As is clear from the pages on this website, there are local community recycling initiatives in most areas of the country. These range from community composting, a small or rural community arranging for the collection and transportation of glass bottles and paper, to bigger, business schemes that start small and grow into community enterprises.See what is going on in your area. If you can't find a project, start one. Have a fresh look at the charity shops in your area – see what they are doing with the clothes they receive. If you find several items that you like, but nothing particular stands out, consider buying several items for the material alone, and get help to refashion them into something stunning. There are several new shops in the UK's high street, mainly based in London but also online and mail order that specialise in reworking items of clothing from secondhand sources. These stores transform tired, old and plain clothes into stunning new fashions – often at the same price as charity shops. Keep an eye out for these stores, and pick up a great recycled bargain! There is also a growing industry of so-called eco-design, which aims to design and produce products that are made in a sustainable way, reusing materials, and which clearly show support for the concept of recycling. A new type of chipboard-like material called tectan, that is made entirely from recycled beverage cartons. This list is just the tip of the recycling iceberg. 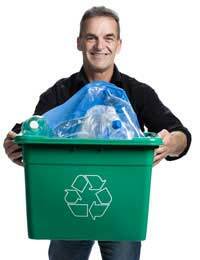 Get out and find the recycling and re-design initiatives happening in your area. Get inspired, then get recycling and re-designing too!